Startup Sesame, Europe’s largest alliance of tech events, has launched its Season Four call for entries. If you haven’t come across Startup Sesame yet, it runs acceleration programmes which grant promising entrepreneurs premium access to 30+ global tech events, and supports startups by offering resources and insights into tech events. You’ll find more information in this presentation about them – here. You can also read its first annual report – about the value of tech events for business development – and details of a fourth call for entries here. Each of this year’s selected startups will receive a personalised curriculum, which will help them identify which conferences are most relevant according to their business objectives. Teams will also benefit from pre-event coaching, including event strategy guidance and networking best-practices. 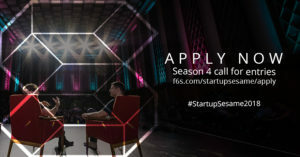 Season four startups are invited to connect and collaborate with a pool of more than 30 mentors from around the world. In its annual report, Startup Sesame surveyed 3,500 entrepreneurs – and 91% said that they believe tech events generate benefits, so apply here before March 1st.